Tax season makes the Atlanta Home Inspector just as anxious as everyone else. Traditionally, April 15th of each year signals the IRS Federal deadline to file. This year, however, federal income taxes will not be due April 15, because of a combination of the calendar, a holiday, and tax law. 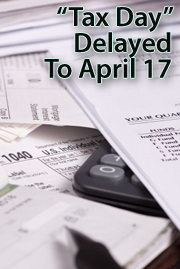 Tax Day 2012 is delayed until Tuesday, April 17. This is the 3rd time 7 years that there will be extra days to prepare. All federal offices are closed on Sundays. This means that that taxes can’t be filed on April 15, as regularly scheduled. Rather, the tax due date should roll over to the first available business day — Monday.